After enduring the sting of taking off his vervain bracelet (he doesn’t drink it anymore so he can be a human blood bag), Katherine compels Matty-Pants to divulge Elena’s life story and to assess her style, including the red thing that’s happening in her hair. Flashback to earlier that day. To keep Elena from taking over and ruining the secret, Nadia chains up Katherine while she tracks down Katherine’s body. But, no luck. Elena gets an invite to Tyler’s welcome back party, so Katherine decides it’s a great way to prove that Elena is fine and dandy. To convince everyone, Katherine calls up Matt and this is where the first scene comes into play. Aaron interrupts Caroline’s stress cleaning to have a message relayed to Elena – Maxfield is out of business. Then Stefan asks a favor of Caroline – help him reunite Damon and Elena, which, really, is best for the world since she keeps his murderous side in check. And it takes them this long to realize Elena has been MIA. Damon returns home where Enzo, looking dapper, is chilling on his couch. Enzo figured out about Damon’s little revenge plan against the Whitmore family and brought an unconscious Aaron along as a gift. 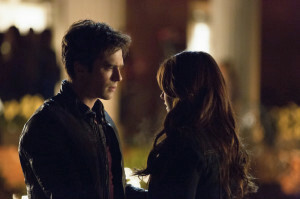 Because Elena would hate him, Damon refuses to kill Aaron; he instead snaps Enzo’s neck and compels Aaron to leave town. Cocky with her Elena impersonation at the party, Katherine questions Stefan on how he’s handling her death. He’s fine, much to her dismay, and mentions that her body is where Damon believes she was always meant to be. Light bulb moment for Katherine – it’s in the old tomb. Caroline reveals her and Klaus’ recent forest encounter to Katherine, who intentionally repeats it loud enough for Tyler to overhear. Fuming, he has a mini wolf-out, until Stefan breaks up their argument and defends her. At the tomb, Nadia’s Traveler friend Mia swipes some of Katherine/Elena’s blood and mutilates her dead body, but can’t complete the spell before Elena shines through and dashes into the woods. As Mia continues, Elena experiences flashes of Katherine’s life. She finds Damon’s warm embrace, then Katherine takes complete control. Clueless, Damon gives a heartfelt apology for the break-up, but Katherine insists that they’re over and forms a sassy smile as she strolls away. Nadia plans on mother-daughter travels, but Katherine insists on staying in Mystic Falls – for the first time, no one’s coming after her. Nadia’s game. On Katherine’s checklist: daughter, immortality, and Stefan. On his way out of town, Aaron stops for someone lying in the road … it’s Damon, who brought Enzo along as a student. Damon proves he’s the monster Elena sees him as by eating Aaron. Coming off last week’s special hour and mini-launch board, “The Devil Inside” managed to take what could have been a standard filler episode and turn it into a shining display of the characters’ true natures. It mostly dealt with the fallout of past events and how that fallout cements the characters’ futures, making the story live either in the past or in the future, not the moment. In the middle of a season that has delved so deeply into the greater (and greatly convoluted) mythology of their world, “The Devil Inside” took a much-needed step back to venture into primetime soap territory where it focused on the emotions of the characters we’ve all come to love. Without reflective episodes like this, the series would lose its foundation as a story about a group of friends struggling to live as and among supernatural beings. How many series can essentially get rid of their main character for the foreseeable future and not send the audience into petition mode? Very few, and even with the 99% chance that Elena’s coming back, it’s a testament not only to the writers’ ability to craft daring stories, but also to the strength and likability of the other characters on The Vampire Diaries. In addition, Elena has almost always been run-of-the-mill in my opinion, so I don’t expect her absence to create a gaping hole in the series. That being said, I would be pleasantly surprised and even welcome a point when I would miss her. The one minor criticism I have for “The Devil Inside” is the speed at which the Travelers were able to subdue Elena’s power over her own body. It feels like a missed opportunity to explore a different kind of possession than when Klaus took over Alaric. This time, a duel existence would have been a fascinating struggle to watch play out with more acting chops than required in the two moments Elena found herself very confused. While those moments did do their part to enhance the drama and urgency, and the desire not to drag out the story or diminish the other characters’ intelligence may have been the motivating factors for such a decision, I was hoping to see Nina Dobrev create a milder version of Alpha from Dollhouse – an erratic, flip-flopping character. Granted Katherine is several hundred years older, thus infinitely more powerful than Elena, but her dominance made Elena look weak in a way that contradicted what Damon asserted – that thinking he would change Elena gave her too little credit for her strength. Aaron, being an originally uninformed human combined with the fact that Damon had it out for his family, was doomed from the beginning. Since the audience already expected his demise, this meant that it had to serve an important purpose in the story instead of being there for simple shock value. And it did. The return of cold-hearted, people-eating, trouble-causing Damon sprung forth from such a perfectly strung sequence of events. The build-up of several characters harping on how Elena makes him a better person and of Damon’s own confession that he screwed up allowed for the rejection from Katherine as Elena to genuinely feel like it would be the breaking point. Rejection has a history of causing Damon to do reckless killing, as first seen back in season two when the doppelganger ladies both reject him and he reacted by snapping Jeremy’s neck. The callback was just one example of how this episode was a true character piece. The fallout between Caroline and Tyler was utterly heartbreaking and played so well from both actors that it overpowered the fact that these scenes were not far from what was expected – for Tyler to get angry and Caroline to feel bad. Tyler, who started out as a stereotypical jock and turned into a more caring but still egocentric guy, handled the situation by having a pity party – his parents are dead, his girl slept with his nemesis, and he doesn’t have a future planned. Even though he reacted this way and it was his decision to walk out on Caroline, it’s amazing that there was still a feeling sorrow for him. Caroline, who was introduced as a preppy and insecure high schooler and is now better classified as a loyal and good-natured friend, spent the evening having her spirits lifted. The Caroline-Stefan chemistry has been on the rise, so it’s no surprise that he was able to convince her that she’s not as bad of a person as she feels. This contributed to an enjoyable Stefan, a side to him we unfortunately haven’t seen much of lately. In the coming weeks, the good kids of Mystic Falls have a familiar slew of antagonists to keep in check, but that may make it all the more difficult. Even though everyone is well aware of how Damon operates, his team-up with Enzo unleashes a new and unpredictable side to him. Up until now, Damon’s evil antics have been demonstrated mainly as sole endeavors, so now there’s an eagerness to see how teamwork can create more clever and devious acts. Also posing a problem is incognito Katherine, and it’s a safe bet she won’t be outing herself so quickly like Silas did. Thankfully, Nadia knowing the truth will not keep Katherine buried in the Elena lie the whole time, so I’m most excited to see how classic Katherine, that perpetually clever and snarky survivor, manipulates her way through this new lease on life.